Most successful album for Ratti Entertainment. With the success of the Midwest Funk Volume 2 compilation album hitting #67 on the billboard charts, Midwest Funk Volume 3 exploded at home and overseas. The Midwest Funk Volume 3 is Ratti's biggest selling album project to date. 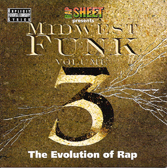 The success of the Midwest Funk Volume 3 came from three important marketing factors. First it was a double CD. One rap disc (The Evolution of Rap) and one R&B disc (The Theory of R&B) which has never been done before. Both CD's were packaged together and priced as a single CD, so the second CD was a free bonus. The second factor was adding artist from all over the United States. The third and deciding factor was adding big name artist to the album project. A few of the big named artist that appeared on the album was Twista, Co-Coo Cal, Souljah Boy, Hoffa from the KillArmy and the multi-platinum group Troop. Midwest Funk Volume 3 - Click Here To Listen!